But what I really appreciated in this book is the fact that it uses already existing solutions to solve the issues we are facing.Indeed, some experiments carried in specific cities or countries are successful in tackling a difficulty. Mr. Brown simply proposes to broaden the scope of these most successful experiments and apply them globally. Answers to soil erosion, overpopulation and so on already exists, it is no science-fiction. We now need a real political will to do so. Another thing that I most liked in this book is that it provides an estimate of how much it would cost to restore totally the Earth and make it livable and enjoyable for the future generations. It also proposes many ways to improve the well being and health of the million people that can’t satisfy the most basic needs, such as eating or drinking safe water. All this would cost a mere 161 billion dollars per year, to be compared to the hundred of billions dollars given to polluting industries (coal mines, oil companies… ) via incentives and to the 975 billion dollars of military expenditures worldwide each year. As an example, President Bush recently asked for an additional 70 billion dollars for the war in Iraq. For this amount of money, we could work on a universal primary education and health care (respectively 12 and 33 billion dollars per annum) but also restore fisheries (13 billion dollars p.a.). As Mr. Brown notes, failing to pay these 161 billion dollars (109 billion euros) would not only endanger our very survival but would literally doom the people that would inherit this beautiful planet from us. To the author, military expenditures often treat the symptoms of poverty (some might call it terrorism, fundamentalism…), these 161 billion USD would treat the cause of poverty and would eradicate it. A brilliant prospect that is truly sustainable as it addresses the three sides of sustainable development : the environment, the society and the economy. Albeit the fact I find Mr. Brown’s (pictured right) views sensitive and very interesting in all above-mentioned topics, I disagree on three particular topics that are nuclear and wind energies as well as biofuels. 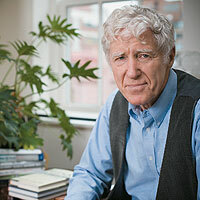 In this version (see below) Mr. Brown still believed that biofuels were part of the solution. It is no more the case. I do hope that in Plan B 4.0, the author will reverse his position on nuclear. Mr Brown totally opposes nuclear energy as it is to him a threat to world peace. To me, nuclear is a sensible way of producing large amounts of electricity. 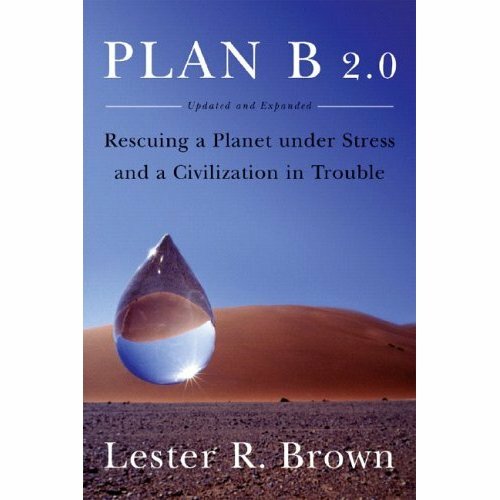 To conclude my review, please note that this refer to Plan B 2.0, I recommend you to read its update, brightly named Plan B 3.0, which was released in early January and is now stressing the disadvantages of biofuels. If this article made you read Plan B 3.0, please do send me your views on it. I will gladly read you. Appreciation : A must read on environmentalism with concrete and realistic solutions. If you think we are heading toward certain doom, this book will give you hope as solutions not only exist, but are already applied somewhere. I am looking into reading this book. Thanks for the insight and your review.